I competed in the Alpine Junior World Championships in Roccaraso, Italy in 2012 - the only competitor from Ireland. So it's great to see that there will be 3 competitors at the 2016 Championships which will be held in Sochi, Russia next month. My congratulations to Tess Arbez, Cormac Comerford and Garreth Reilly on their selection. I am sure they will enjoy the experience as much as I did in 2012 - especially since they will have their team mates to share it all with which will make it so much nicer. 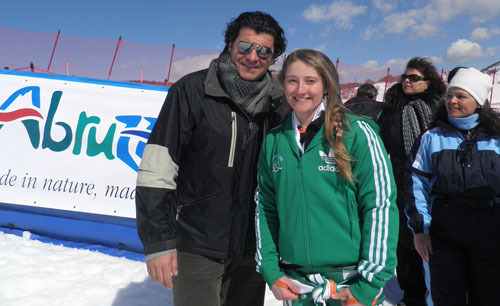 One of the highlights of my time in Roccasaso was meeting the Italian slalom legend Alberto Tomba (above)!